Sorry for the long hiatus; I've had some trouble with my shoulder that made typing tedious. However, I kept reading. I am better now. This is just a little thing, part of a larger project on type-C orders. Death, Hermit, Last Judgment, and World. I think Death, Hermit, in that order, are most likely. I think this printed sheet was never more than 20 cards, as it is half a sheet of the paper size called English medium, which is over and over again the size used for printing cards. So some system was used: perhaps a block with ten copies of World, and ten copies of Judgment, to produce full decks. Assume the carver did the first two squares of the third row, but did not finish that row for some reason, but instead next did all the second row, then all the top row, then all the bottom row, then the three remaining squares of the third row. Besides that one odd thing of stopping after the first two squares of the third row, the carver always went left to right, and always completed each row. After carving on a row, the next row he carved was always the one above it, or after the top row, the bottom row. Devil, Tower, Star, Moon. Sun, -- Last Judgment & World are not on this block. 2) switching Hanged Man and Hermit. This implied order is as similar to the Viéville order, as one type-C order usually is, to another one. Viéville and the Susio poem order are nearly identical. Since a simple rule for the order of carving the squares (with only that one odd thing of jumping up a row after the first two squares carved), produces a plausible order, I think this may be the real order. This was a welcome supplement to the list by Dummett 1980, which I have reproduced at http://www.forum.tarothistory.com/viewt ... f=9&t=1175, on p. 401 of the book. Alciati is actually 1544. I don't know where 1547 comes from. Compared to these lists there are two anomalies. Fortitude is never right before Justice. That is a feature of the A order; it is also a feature of the B order, but with many intervening cards. Also, there is only one virtue between Love nad Chariot, if that. To all these: at the end the fool is recognizable by his behavior. My main innovation is putting lightning before devil. Most translations have it after, but in the Latin it is clearly before. But now look at forti and justo. Which is lower in the order? In this poem the first mentioned is generally the higher. But it is not completely clear, because it is not implied that amor is higher than the two after it. It is just that "Love yields to the strong and the just", without saying which precedes which. So Alciati's order might in this regard be compatible with the putative Cary Sheet order. I have no resolution. It is just that the issue of what goes where now seems unclear in Alciati. 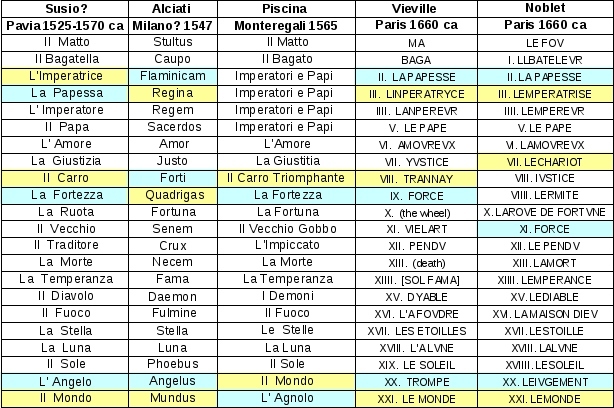 If it is like the Cary Sheet as you interpret it, they are still different in another respect, namely the placement of both virtues between Love and Chariot, which is similar to the A order, except that all 3 virtues are so placed) In Piscina, however, we have one virtue so placed. I am tempted to ask, which of these three orders came first, second, etc.. But I get no clear picture. But perhaps someothing emerges from the second anomaly. The Cary Sheet has Love immediately before Chariot, as in the French orders, which are later than the Italian. But perhaps what is true is that France made this change and Italy didn't, or under France's influence Northwestern Italy made a compromise, in which case the Cary Sheet would be French, in particular the style of Paris as opposed to Lyon. But an early one, influenced also by Florence and Ferrara. That also would explain the look of the Pope and Popess. In the PMB and even the Catelin Geoffroy (which does not resemble the Marseille) the Pope has no acolyte. A kneeling figure first appears in the Charles VI, lacking in the Rosenwald, but present in the Ferrara printed cards and then the Anonymous Parisian's sphinx, as can be seen on Tarot Wheel's Pope page, http://tarotwheel.net/history/the%20ind ... 0papa.html. Added later: It strikes me as possible that the "Charles VI" may have gone from Florence to France with Charles VII. Savonarola seems to have enjoyed piling his "guest" with Medici luxury items, such as the magnificent illuminated Medici Trionfi of Petrarch now in the Bibliotheque Nationale. I have written about that one in a couple of places. Thanks for this. I know just enough to know that I don't know what order "Cedit amor forti & justo: regemque sacerdos," implies. I don't get to Marco's original posting of that chart. (I think you will have to click the links in your posting, not in my quote from it.) I am probably just making some silly mistake. Did I just not see it? Do I have to go to other pages of the same thread? I would like to see Marco's posting, as I don't understand where the names in the Viéville column come from. Viéville's cards don't have labels, and neither "Trannay" nor "Vielart" is a word in French, although I can kind of see that "Vielart" must be "Oldster." but I'd like to see Marco's original posting of it.